Its ability to resist rust and corrosion has made stainless steel a popular choice for today’s kitchens and bathrooms. However, the daily dirt, dust, and grime that can quickly cover the stainless-steel appliances and fixtures can level it open for becoming corroded and rusted if left for a period. Luckily, stainless steel responds great to cleaning, as long as you follow the rules, and with a homemade stainless-steel cleaner, you can do it without using harsh chemicals. But, what cleans stainless steel? The simplest way to clean your stainless steel appliances and fixtures is to use some warm water and a clean cloth. Microfiber cleaning cloths work great because of their exceptional ability to absorb water, as well as the fact that they won’t scratch the surface. To prevent water spots, make sure to dry with a clean towel thoroughly. If you are looking for a bit more cleaning power, here are some great DIY stainless steel cleaner recipes you can make at home to get your stainless-steel appliances and fixtures sparkling clean. Cleaning your stainless-steel fixtures and appliances couldn’t be easier and is less expensive than the cleaners you buy at the store. Plus, when you make your cleaner at home, you can avoid using products that contain harsh chemicals. Here are some great organic stainless steel cleaner recipes that you can make at home. If you are looking to clean your stainless-steel appliances and fixtures without using toxic chemicals, here’s a great non-toxic stainless steel cleaner recipe you can make at home. The lemon essential oil that you use in this recipe is necessary if you want a smudge-proof cleaner that still brings out the natural shine of the stainless steel. Using a funnel, pour the vinegar and water into the plastic spray bottle. Add the liquid dish soap to the mixture. Add in the lemon essential oil. Put the top on the spray bottle and vigorously shake. Spray the solution on your appliance and fixtures and wipe clean with a dry microfiber cloth. This reliable and efficient homemade cleaner is simple to make and only requires a few ingredients that are relatively inexpensive. In a 16-ounce glass spray bottle, combine the alcohol and vinegar. Using a funnel, add the water to the container. Store the mixture at room temperature. If you don’t want to have your house smelling like vinegar, you can add a few drops of your favorite essential oil blend. Using distilled white vinegar, a condiment that most households already have sitting in their pantry is a great, non-toxic, organic stainless-steel cleaner. Cleaning a stainless steel sink with vinegar naturally removes spots from the surface of your stainless-steel and is safe and inexpensive. In a 2-cup capacity old dishwashing detergent bottle, mix the water and vinegar. Squirt the solution onto a microfiber cloth and wipe down your appliances in a clockwise motion. With another clean, dry cloth, wipe the area in a counterclockwise motion until dry. This recipe uses all-natural ingredients that you can purchase inexpensively at your local grocery store. What’s even better, is you can use this method to clean your pots and pans as well. Combine the ingredients to make a paste. Rub it onto your stainless-steel appliances, fixtures, pots, and pans. Let the paste dry, then wipe it off with a clean cloth and water. With another clean, dry towel, buff the area dry. This recipe uses baking soda and lemon juice, ingredients that you probably already have in your kitchen; if not, you can pick them up at any grocery store. Lemon juice and baking soda make a great cleaner for your stainless steel. The lemon juice is naturally acidic, and will thoroughly disinfect the area, while the baking soda is gentle and a natural deodorizer. This recipe is just as effective as the chemical cleaners you can purchase at the store but safer to use. The first thing you will need to do is dampen a clean rag with the white distilled vinegar and wipe the cloth over the stainless steel. Rubbing the surface with white distilled vinegar helps to remove any spots and prepare the area for cleaning. Next, make a paste using the baking soda and water. With a soft cloth, rub the baking soda paste onto the stainless steel. Let the solution rest for several minutes, then rub the paste off entirely with a dry towel. Dampen another soft cloth with the lemon juice. Rub the fabric over the stainless steel to help remove any limescale that has accumulated. Rinse the area with water and wipe dry with a clean, dry towel. Mix the water and vinegar and pour into a glass spray bottle. Shake well to mix. Spray your stainless steel with vinegar. Wipe the area down with either a paper towel or a microfiber cloth, make sure you are wiping in the direction of the grain. Rubbing the area with a clean cloth will help to remove the dirt and grime that has collected on your stainless steel. Place a small amount of olive oil onto another clean, soft cloth. Rub down the stainless steel, making sure you are rubbing in the direction of the grain. This recipe works also great as oven cleaner on a stainless steel stovetop since it won’t scratch the surface at all. The olive oil will help make marks disappear, leaving your stainless steel shiny once more. 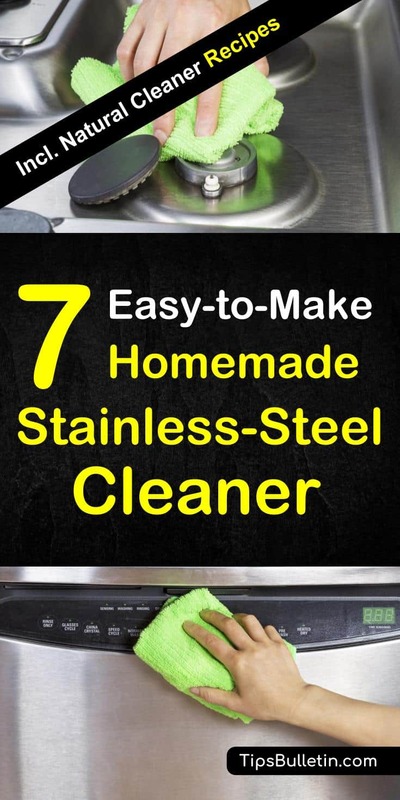 This is a great non-toxic homemade stainless-steel cleaner combines some household ingredients that not only deep clean but will also disinfect and deodorize your stainless steel. The baking soda and vinegar work to remove caked on, sticky residue, while the olive oil polishes the stainless steel, bringing the original shine back. Combine the vinegar and water in a glass spray bottle. Add the liquid dish soap and baking soda. Spray the entire area of stainless steel thoroughly and wipe clean with a microfiber cloth. Next take a clean, dry microfiber cloth and add a few drops of olive oil. Rub the area down with the olive oil, buffing it with a clean, dry cloth. If you are looking for the best natural stainless-steel cleaner, you don’t have to look much farther than your kitchen. White vinegar and olive oil, hands down, does the best job of cleaning your stainless steel without having to resort to using harsh, toxic chemicals that you find in most commercial stainless-steel cleaners. If you don’t feel like taking the time to make your own homemade stainless-steel cleaner, one of the best commercial products to buy is Howard natural stainless steel cleaner. The product uses all-natural, vegetable derived ingredients that can quickly clean oily fingerprints, food grime, and kitchen grease. Its streak-free formula beautifully shines all stainless-steel surfaces. However, when you are looking for a safe, toxic-free stainless-steel cleaner, you need only look as far as your kitchen pantry. All of the homemade stainless-steel cleaners we’ve shown you are safe and environmentally friendly and will leave all your stainless-steel surfaces free of fingerprints and grime. 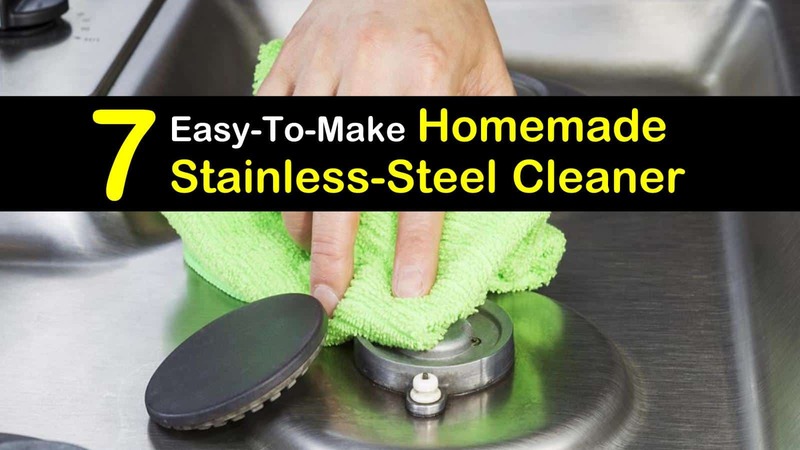 If you found the information on how to make a stainless-steel cleaner helpful and know someone who would benefit from these cleaning recipes, please share this article with them.